WikiLeaks founder Julian Assange will be expelled from the Ecuadorian embassy “within hours to days“, according to sources. 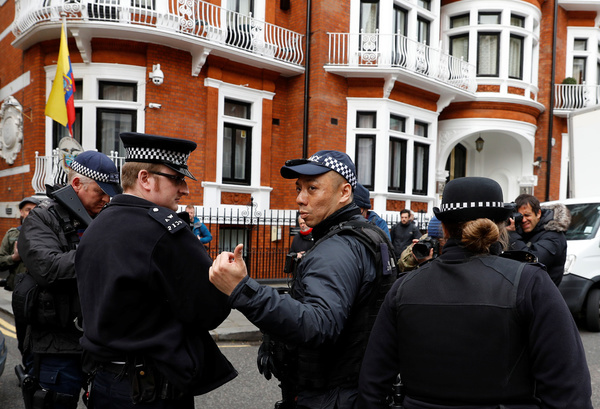 A “high level source”, quoted by WikiLeaks, revealed the Australian could leave the central London embassy as early as Friday morning. He has been in Ecuador’s London embassy since 2012 after he sought refuge after a British judge ruled he should be extradited to Sweden to face sexual assault allegations. The case was dropped by Sweden in 2017, but the 47-year-old remains in the embassy. 20 hours ago Despite WikiLeak’s tweets this morning, a senior Ecuadorian official said no decision had been made to expel Julian Assange from the embassy. Ecuador’s foreign ministry released a statement saying it “doesn’t comment on rumours, theories or conjectures that don’t have any documented backing”. 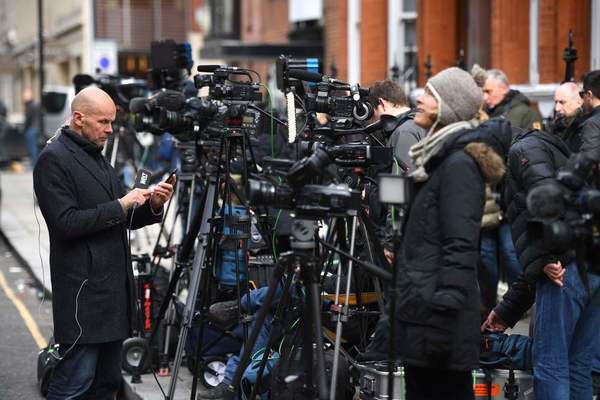 20 hours ago The scene outside of the embassy After news broke, journalists and photographers scrambled to outside of the central London embassy. The pavement opposite was lined with more than 20 members of the world’s media, many with TV cameras. A small group of protesters have also gathered, in support of Mr Assange. 20 hours ago Mr O’ Reilly, pictured below, said he has been sleeping rough outside the building for 130 days. 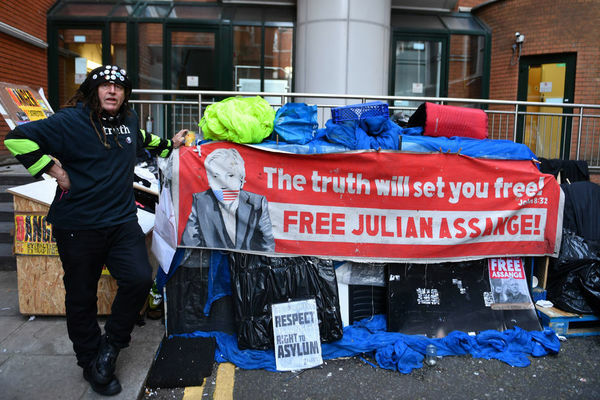 The 59-year-old, who has set up a makeshift shelter in a street beside the embassy, said he believes reports Mr Assange will be expelled, adding Ecuador “wants to deliver the head of Julian Assange”. He said he expects more supporters to arrive. 19 hours ago A timeline of all the key dates so far Mr Assange came under intense scrutiny after the whistle-blowing website began releasing hundreds of thousands classified US diplomatic cables. August: Mr Assange tells a press conference he will be leaving the embassy soon following speculation that he is seeking hospital treatment for heart and lung problems. He later brushes off reports that he is about to give up his fight against extradition to Sweden. November: Mr Assange loses a legal move in a Swedish appeal court aimed at revoking his arrest warrant. December: Mr Assange appears on the embassy’s balcony to greet Noam Chomsky, the US philosopher and activist. Hollywood actor John Cusack also visits the WikiLeaks founder later in the month. February 13: Westminster Magistrates’ Court upholds the warrant for the arrest of Mr Assange for skipping bail, in a judgment by Senior District Judge Emma Arbuthnot. She urges him to show the “courage” to appear in court. 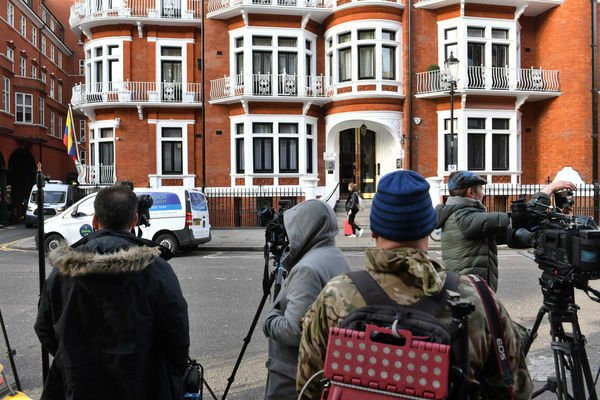 19 hours ago Pamela Anderson has weighed into the news 19 hours ago A van has arrived at the Ecuadorian Embassy bearing a billboard in support of Mr Assange, and parked in a space reserved for diplomats. 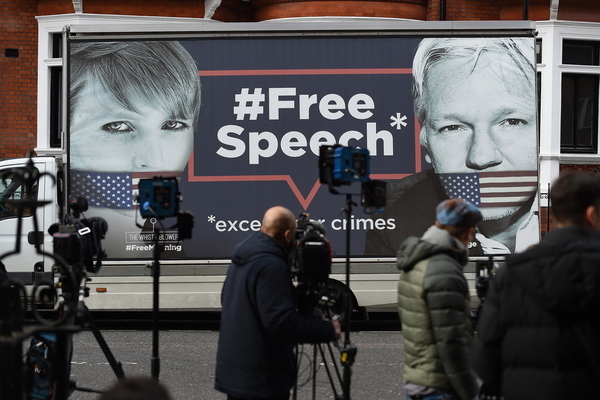 A picture on the billboard showed Mr Assange gagged by an American flag with the message #FreeSpeech. 19 hours ago The van with the billboard in support of Mr Assange has now been moved. It was moved after an armed police officer told the organiser of the demonstration they had received a call from the embassy. 17 hours ago Demonstrators, including one wearing a mask used by the Anonymous group, unfurled a banner in support of Mr Assange outside the Ecuadorian Embassy. Three people, including the masked supporter, held the banner as they posed for photographs in front of a large gathering of media crews. 17 hours ago Photos from the scene Several people, including a huge media crowd, have now gathered outside of the embassy. Many officers have also been pictured. 17 hours ago Speaking from outside of the embassy, supporter Emmy Butlin said she has been demonstrating since Mr Assange was fist granted refuge. She was part of a “solidarity vigil” today. She said Ecuador has changed its position since a change of government, adding: “They have now become unwilling to protect Julian Assange, the publisher of WikiLeaks. “It’s very clear that the negotiations of various parties – the United States with Ecuador and with the UK – to hand in this man to be tried and charged in America for espionage is well under way. “We believe that the UK Government, which is our government, should stop cooperating with the United States, the Trump administration. 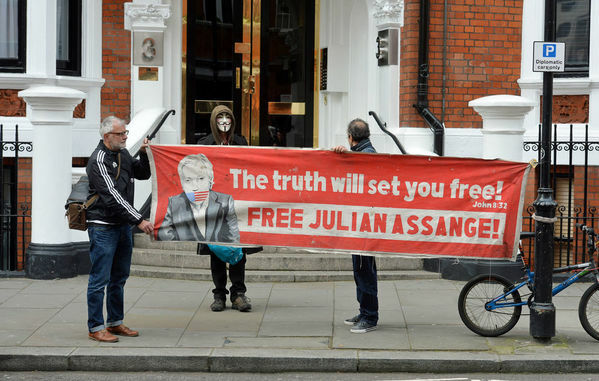 They should stand by free speech, by human rights and by international law.” 15 hours ago Channel Four reporter Symeon Brown has claimed there is “more press” outside of the embassy than supporters of Mr Assange’s 15 hours ago A statement from Mr Assange’s legal team has came in. It reads: “Expelling Julian Assange would be illegal, violate international refugee law and be an attack on the UN which has repeatedly called for Assange to be able to walk free. “It will be a sad day for democracy if the UK and Ecuadorean governments are willing to act as accomplices to the Trump administration’s determination to prosecute a publisher for publishing truthful information.” 12 hours ago A UK Foreign Office spokesman has said: “We do not comment on speculation. This is a matter for the government of Ecuador. Previous Previous post: $FYI: Declare Your Independence with IPFS!